I’ve been retired for five years. I’m almost 67 and the Social Security Longevity Calculator claims I’ll live to be 85. That will be in 2036. I need to financially survive another 18 years (or 216 months since we pay bills by the month). Of course, I could die this afternoon, or live to be 116. Judging my own health and psychology, I tend to think I can make it to 78, which would be 2029. My financial security comes from a pension, social security, and a 401K. All three are under threat from conservative political ambitions. Plutocrats want to siphon off all the remaining wealth they do not control. As long as Republicans run the government, anyone who is not wildly rich should worry about their economic future, even the moderately wealthy. Wealth inequality has been a hot topic for years, but what I’m really worried about wealth siphoning. The insanely rich are looking for large pools of money to target for acquisition. All the main sources of traditional capital investments are within their control, so they are looking at large social pools of money like Social Security, Medicare, pensions, welfare programs, public healthcare, and so on. If you look around to any large body of wealth that’s not in private hands, it’s in the crosshairs of the plutocracy. I tend to believe, and hope, that Social Security and Medicare will be around for the rest of my life. However, the success of the greedy under Trump has been startling. Trump quickly transferred a tremendous amount of social wealth to the rich, and he’s working hard to do it again as often as possible. The conservative’s goal of shrinking the government is really a way to siphon off trillions of dollars by the wealthiest of citizens. If they get their way, we’ll lose Social Security and Medicare, two programs I depend on, as do tens of millions of other people too. I could survive without Social Security. But I know plenty of people who couldn’t. I could survive without Medicare as long as I was willing to die when I got expensively sick. Without Medicare, having a heart attack will kill either me or kill my 401K. As a consequence the rich siphoning off social wealth, the federal deficit is skyrocketing. Ultimately, this will destroy the economy, which will destroy everyone’s 401K savings. Without Social Security and 401K savings, I could probably still survive in the poorest part of town with just my pension as long as I didn’t even need moderate healthcare. As the federal government comes apart, it puts the squeeze on state governments. That will threaten my pension. Of course, by then, almost everyone will be destitute, and it might not matter. The one thing I hope comes out of the 2018 midterm and 2020 presidential elections, is stability. Of course, this is like wishing I’d win a billion dollar lottery. Too many people are casting votes simply because they don’t want to pay taxes. I don’t like paying taxes either, but all those deductions I made for fifty years is now providing me an income and medical care. I bitched then, but it’s truly wonderful now. The disaster in Puerto Rico is truly horrendous. What’s important now is how we respond. I worry this Mag-10 catastrophe will be shoved off the news and be forgotten. I know Republicans are horrified at the cost of helping Puerto Ricans but we should make Puerto Rico our 51st state and divert all that tax-relief for billionaires into rebuilding their country. The scale of such a project would be awe-inspiring like the Apollo moon program. You have to admit as a taxpayer, making the rich richer has gotten rather boring. I just can’t work up any more sympathy for people with private jets, and I’m tired of them conning us into giving them more money because of their self-serving lies about helping the middle class. Rebuilding our infrastructure will make America great again. Designing a self-sustaining economy for the 21st-century will make America great again. Cleaning up the environment will make America great again. Creating social equality will make us great again. Inequality in all its forms is only flushing us down the toilet. The intellectual challenge of retrofitting Puerto Rico to survive future super-hurricanes is thrilling. And it will be great practice for when we need to rebuild all the southeastern coastal states. Is it possible to create an island paradise that can withstand rising seas and periodic Cat-5 hurricanes? Could we design homes that can be sealed like submarines from flooding and aerodynamically shaped to withstand 250 mph winds? Can we create a cell phone, power grid, water, and sewer system that can take a beating and keep on ticking (like a Timex watch in those old commercials on Mutual of Omaha’s Wild Kingdom)? Is it possible to develop a self-sustaining economy for 3.6 million people that can periodically withstand the worst nature can throw at them? Since we won’t solve global warming we need to learn to take regular spankings from a pissed off Mother Nature. After we retrofit Puerto Rico and other Carribean islands, we can work on Florida. Puerto Rico is the canary in the coal mine. Those folks down there are Americans even though we treat them like red-headed stepchildren. Congress is driven by greed, so I doubt those bastards will change their stripes, but maybe, just maybe, a disaster of this size will crack open their greedy little hearts just enough to let in a ray of compassion. I don’t think our rich folks need tax relief as bad as 3.6 million Americans without power, water, food, internet, and cell phone coverage. Author jameswharrisPosted on September 30, 2017 Categories Climate Change, Ethics, Global Citizen, Global Warming, Inspiration, Inventions, Politics, Wealth inequalityTags Charity, Puerto Rico, Tax Cuts, Tax Relief4 Comments on Will Puerto Rico Be The 1st Climate Change Retrofit? The UNHCR recently reported that 65.3 million people were displaced around the world in 2015, or 24 people per minute. All indications suggest a higher figure for 2016. Civilization is a thin veneer, and when it rubs too thin, people move to a thicker location. Donald Trump wants to build a wall between the United States and Mexico because he’s worried about immigration from the south. The British voted to leave the European Union partly because of fears over immigration and refuges. Yet many of these same fearful people refuse to believe climate change. Now that might seem like an abrupt change of subject, but it’s not. The major consequence of climate change is mass-migrations. Just look at the University of Notre Dame Global Adaption Index (ND-GAIN). 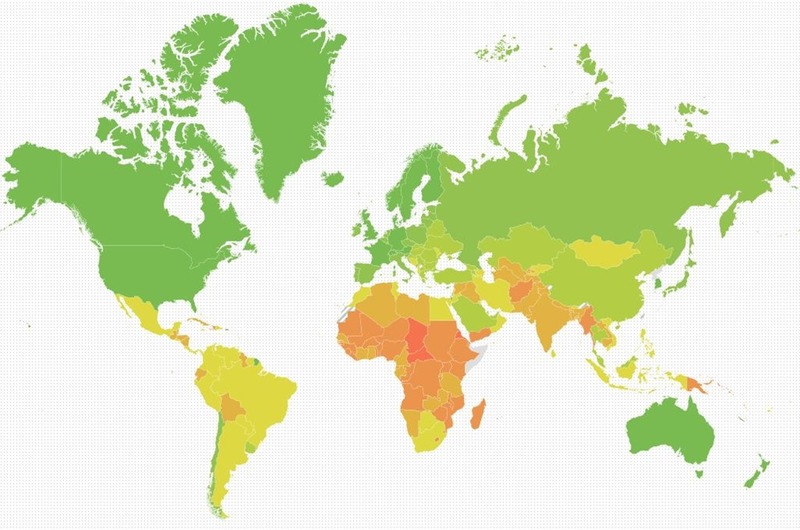 It ranks countries based on projected impact of climate change. You can see the full ranking of 180+ countries here. Sooner or later, all the top ranked countries will want to build walls to keep refuges from the bottom rankings moving in. The United Kingdom is ranked #4, which makes it a prime destination for most folks fleeing collapsing civilization. The USA is #11. (Maybe England needs to worry about their American cousins moving back home.) Living in a top ranked country might seem lucky because you’ll avoid the worst of climate disasters, but it also means your country will be seen as a lifeboat to those who are drowning. I have to wonder if climate change deniers are only pretending not know the truth. Just look at ND-GAIN’s map. Most people in trouble will be moving north. I think wall building is either a conscious acceptance of climate change, or an unconscious awareness. It’s reality is starting to sink in. Notice that most of the refuges the wall builders fear are coming from countries ND-GAIN are listing as vulnerable to climate change. Have climate change migrations already begun? Many countries in the southern hemisphere are suffering from economic collapse, and countries in the middle east are experiencing political, economic and social collapse. All of those locations also suffer from poor weather and limited natural resources. To solve climate change and mass migrations means solving wealth inequality. That’s a very liberal solution, which probably explains why so many conservatives refuse to accept climate change. Will walls protect the haves from the have-nots? And why haven’t wall builders proposed programs to create stability in countries that are coming undone? Wouldn’t that be more realistic than building Maginot lines on our borders? Instead they want to tear up international trade agreements, which will only make things worse, and thus accelerate mass migrations. If they’d put the money they’d spend on a US-Mexico wall into the Mexican economy, wouldn’t that be more helpful? Wouldn’t a thriving Mexican economy become more effective than a wall? Venezuela is #107 on the ND-GAIN list. Just read some of the news stories about Venezuela’s economic collapse. Will they become the new Syrian refuges? Brazil isn’t doing well either. How many wealthy South Americans are currently flying over where Trump wants to build his wall? Isn’t it in America’s best interests to make sure South America doesn’t collapse? If the goal of wall building is to stop refuges, isn’t it more practical to stop the creation of refuges than build walls to keep them out? These books show us the future. We can solve our problems, or hide behind walls (for a little while). Building walls are a last-stand tactic. Think how well walls work with zombies. Which makes me wonder if zombies aren’t modern metaphors for poor people, revealing everyone’s underlying fear of being overrun by world poverty. If you don’t want millions of people moving to America, fight climate change and wealth inequality. What we want is a sustainable economy that is environmentally friendly. Capitalism, as it currently exists, is a Ponzi scheme that’s transferring wealth from the many to the few, with the huge side-effect of creating climate change. It will collapse if we don’t fix it. And we can’t fix climate change without fixing capitalism. If we don’t change things, the 1% will try to wall off us 99%. Trump’s wall is just the first of many that will fail. Denying climate change is merely sticking your head in the sand. Building Trump’s wall is acceptance of climate change, but no actual protection. Trump’s wall is no more practical than The Tower of Babel. After writing this I began to wonder how often people and society change. Are we condemned to always follow the same behaviors? That made me think of When Everything Changed by Gail Collins. After I had read that book I realized our society had changed more because of women’s rights than the introduction of computers and smartphones. We’re constantly adapting. And that’s hopeful to realize.